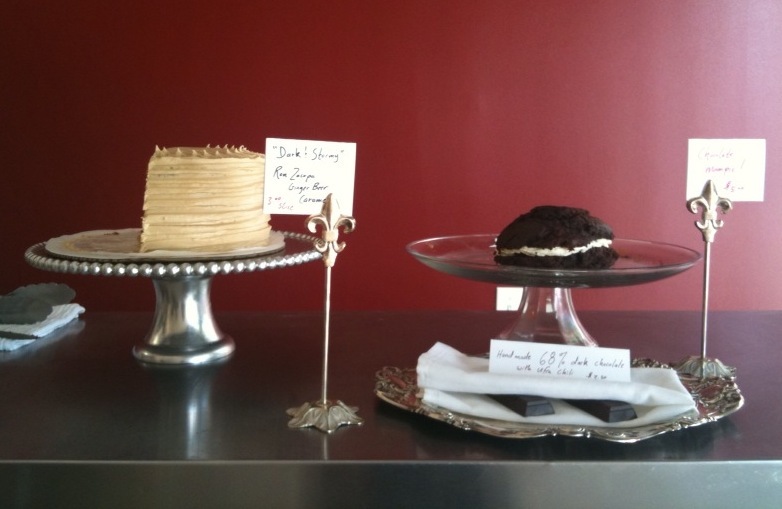 Last week, we learned about the tiny shop Kim and Jake's Cakes, tucked into the shopping center at Table Mesa Road and Broadway. Word had it that the southern-themed spot had a knack for tender, boozy sweets, like margarita and dark-and-stormy cakes. So we quickly dropped all we were doing and headed south from the office. Indeed, the bakery, run by two ex-professional cyclists, serves up generous, luscious slices of cocktail-inspired cakes, as well as more traditional offerings, like carrot cake and moon pies. All the options have nuanced, finely developed flavors, influenced by the southern recipes of the owners' pasts. And one forkful of cake provides an escape to slower times and places. Kim & Jake's is a Simple Refuge from our busy, highly wired lives--and it's a great example of how expansive the cocktail movement has become, as well as how classic beverage flavors are Breaking Free of their conventional forms. If you have a chance to drop by, plan your trip for a Wednesday (happy hour with $1-off slices runs from 5 to 6 p.m.) and watch out for the margarita cake. Based on the Rio Grande Mexican Restaurant's famous cocktail, the dessert layers tequila-laced cake with sweet strawberry puree and lemon curd.